Happy Gram - Alley Sale Is Saturday! 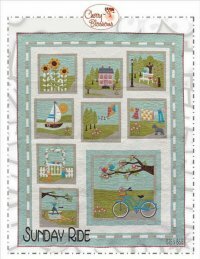 Usher in Spring with this adorable applique quilt called Sunday Ride that finishes 67.5"x85.5". Only $19.99/month for 9 months. Pick up your needle and create landscapes filled with fanciful flowers and creatures from field, forest, and ocean. 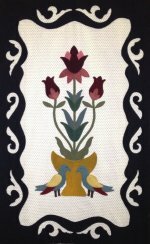 Designer Wendy Williams shows you how to make 15 appliqué projects in a style that’s part folk, part contemporary, and entirely delightful. The Quilter's Ultimate Garage Sale will take place Saturday, April 12, from 10 a.m. - 4 p.m. This year the Alley Sale coincides with McKinney's Art Walk, which will increase shopping traffic to your booths. Also, the location of the sale has moved to Kentucky Street just in front of the shop due to the construction. Jack Gresham of Mobile Knife Sharpening will be there to sharpen your knifes and blades from 10 a.m. - 12:30 p.m. Unfortunately, he is unable to sharpen scissors on Saturday, but we are rescheduling him for that soon. Shoppers mark your calendars to not miss out on these great deals.